I'm a firm believer in getting kids in the kitchen. I cook for a family of four (five come August) and have to please the whole age range. One way I've found to get the kids to enjoy dinner time is to let them help cook the meals. They're proud of their hard work, and it shows when they eat. This does, sometimes, back fire. Like when I told my 4-year old we'd make some cookies. I found her in the kitchen adding all the ingredients in from memory. She got the amount of butter wrong, and the eggs. But one of the eggs wound up on the floor, not in the bowl, so we were saved there. I think she would have forgotten the baking soda if I hadn't stepped in. But, overall, it worked! And the new recipe is delicious. Pre-heat oven to 350 degree farenheit. In a large bowl cream sugars and butter together. Then add the vanilla. 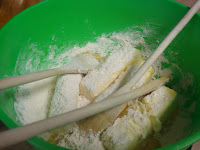 Add more flour if necessary to make the dough stiff. It it's gooey, you need more flour. 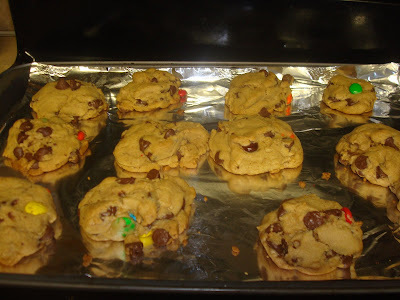 Stir in chocolate chips and M&M's.... but don't use a thin wooden spoon, they break! Form the dough into balls and place on baking sheet. Bake for 10-12 minutes per batch. Alternative ending: Freeze the cookie balls solid and place in bag. These individual ready-to-bake cookies will last in the freezer for 3 months, or until your children find them. Or turn it into cupcakes!! Cupcake Project did cookie dough cupakes a while ago. Much yumminess.